How many pages can I realistically get from the CL-511 colour cartridge on A4 glossy 185gsm paper for full colour photos from my Pixma MP480? Regards, Dave. I'm afraid that we can't calculate the number of full colour photos you could print for you. Canon only specify that the tri-colour CL-511 ink cartridge can print up to 244 pages (based on 5 % coverage on A4 ) or 97 photos (based on 5% coverage of a 10 x 15cm photo). Please use your own judgement from the figures provided to estimate how many photos you should print from your cartridge based on the nature of your printing. How much ink is there left in your Canon MP480 cartridges? Some day your Canon MP480 will use all of your printer ink, and when that happens you'll soon discover that purchasing Canon MP480 ink is generally quite costly. You do not need to panic about paying the steep prices you'll find on the high street because here at Cartridge Save you can pick up all the Canon MP 480 cartridges you will ever want at super low prices. Save more cash on your ink by ordering online with Cartridge Save! There's little sense in spending so much for the MP-480 original cartridge or MP480 compatible ink in the high street when it is easy to save some cash buying online with Cartridge Save. Enjoy full confidence when you buy your Pixma MP480 ink cartridges from us seeing as everything is underwritten by a quibble-free money back guarantee. Don't forget to take into account that each order also comes with free delivery, mostly delivered to your door the following business day! The Canon Pixma MP480 is an affordable multifunction device with an integrated copier and flatbed scanner. This entry-level printer is very capable and packs good value for its price, but it lacks the fancy specs that help increase productivity, such as Wi-Fi, an automatic document feeder, and fax. This printer is small, compact, and lightweight, making it suitable for small spaces. It looks like a simple box at first glance; opening the top reveals the control panel and the small but efficient 1.8-inch colour LCD screen. The output paper tray can also be closed when not in use. Connectivity is limited to USB 2.0, but you have the option to print directly from a memory card. The Canon Pixma MP480 uses inkjet printing technology with a dual-ink cartridge system. The LCD screen and the output tray can be closed when not in use, protecting the Canon Pixma MP480 from dust build-up. The scanner is fast and boasts a maximum resolution of 19200x19200 dpi (minimum: 2400x4800dpi). The copier is also fast and can do 20 ppm in monochrome and 16 ppm in colour. 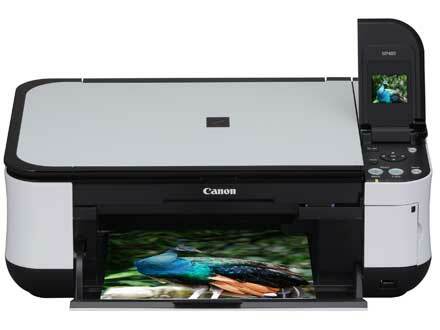 The Canon Pixma MP480 is Energy Star-certified and comes with a 1 year warranty. Set-up is easy; this model is compatible with older Mac and Windows operating systems. As for the print quality, the Pixma MP480 produces laser-sharp documents and above average photos. This printer is fast when printing in draft mode, but becomes very sluggish at 'normal' and 'best' mode. Compatibility can be an issue, as the Canon Pixma MP480 is an older model and is not readily adaptable to newer versions of Mac and Windows operating systems. The graphics software included in the driver CD installs automatically, but is sub-par compared to many other superior graphics programs.